Clare Shepherd is an artist who lives and works in a rural part of Cranborne Chase in Dorset. 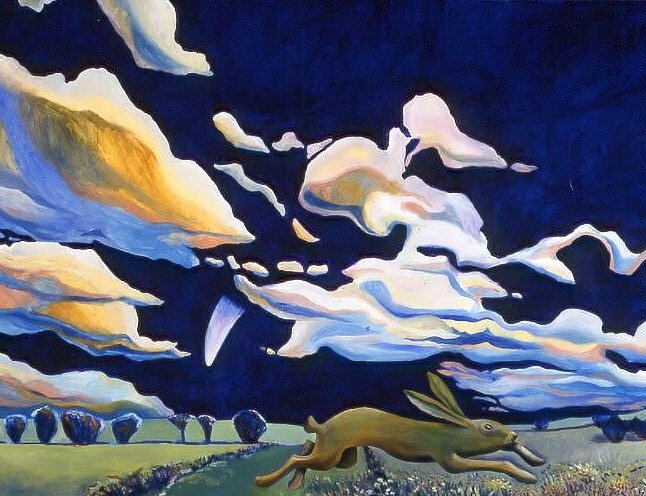 This painting was inspired first by the clear view of Hale Bopp crossing the night sky early in 1997 and secondly by a hare which Clare saw from her bedroom window one evening charging round and round the field opposite her home. Clare felt the need to record the visit of Hale Bopp, and in fact for a while Hale Bopp appeared in every painting she did, including a portrait of her daughter dressed as Anne of Bohemia; the presence of Hale Bopp in the background marked forever the time of the painting. The strangeness of the comet combined with the elegance of the hare have been combined in this painting to produce a magical image which celebrates the passing of a comet and gives status to the hare as one of the important mythical animals in our culture.